Many businesses are unable to afford the assets they need upfront. This presents dealers and manufacturers with a challenge: how do you stay relevant to your customers and help them access the equipment they need, when they need it? A business finance lease could be the solution. 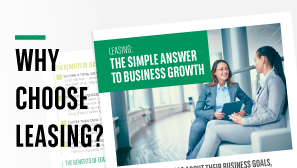 WHAT IS A BUSINESS FINANCE LEASE? A finance lease gives businesses access to the latest equipment in return for a regular rental amount. Effectively a leasing company (the lessor) buys the asset from a supplier and rents it to a hirer (the lessee) for an agreed period of time. At the end of the hire period, the asset should be returned to the leasing company. Generally, the initial cost is lower than other forms of credit such as hire purchase for example. Payments are evenly spread across the whole repayment period and the hirer is committed to paying all of the rental payments. Essentially, this leasing agreement gives your customers access to business equipment at an affordable rental price that can be offset against their taxable profits. The asset repayments count as a business expense and are fully tax allowable. VAT registered companies can claim back any VAT included within the rental payments. What’s more, maintenance costs can be included in the repayment plan which means that your customers don’t have to shoulder the financial burden of any unexpected downtime due to equipment faults. Ultimately, it’s a tax* efficient leasing agreement that allows for accurate budgeting with minimal risk. Your business growth is important to us. Our competitive finance solutions enable you to help your customers afford the assets they need to improve their productivity and increase their profits. If your customers are doing well, your business will too. Each one of our products is packaged simply and is easy to manage. To ensure that you and your sales team get the most from the financial product of your choice, we offer bespoke training sessions and smart mobile tools, helping to drive better sales propositions and customer interactions. We make sure to pay your invoices quickly, often within 24-hours. With a stronger cash flow and lower credit risk, you’ll be able to pursue bigger deals with more confidence. We partner with companies from a wide range of industries to provide financial solutions including IT finance, telecoms finance, van leasing, materials handling finance, construction machinery finance, agriculture finance or printer leasing.